The debate about how much oil is left and recoverable in the world has brought increasing attention to the recovery of oil and natural gas from offshore. And while I suspect that most of those who comment on this site are very familiar with all the terms, some of the more general readership may not be. Let me, therefore, explain just a bit about some of the different words that are being used here - with references and videos, where I can find them - to pictures of the different types of structures that are being used. And if I miss some, please chip in either to ask or answer. Just as on land, we need some form of drilling rig if we are going to drive a bit down through the rock and find us some oil. But, unless we are working somewhere like the North Slope where we can wait until the sea freezes over and drive ice roads out to build islands to drill from, we are going to have to find a different way of providing the infrastructure support for that bit. And here is the first distinction - because a drilling rig, in the offshore sense, is more of an exploratory tool, going out to find oil, rather that developing the known fields and bringing in production. That latter task is left more to production platforms, which can be sited where best to drain the field, and may not even use the initial holes drilled by the exploration rig. As you may have read the Minerals Management Service keeps track of production offshore (as well as on Indian lands) and lest you think that it is not that significant a bunch of folks, they have just handed out $10.68 billion in 2009. Of the $10.68 billion, $1.99 billion was disbursed directly to states and eligible political subdivisions such as counties and parishes. Another $5.74 billion was disbursed to the U.S. Treasury; $449 million was disbursed to 34 American Indian Tribes and 30,000 individual American Indian mineral owners; $1.45 billion was contributed to the Reclamation Fund for water projects; and $899 million went to the Land & Water Conservation Fund, along with $150 million to the Historic Preservation Fund. the importance of renewable energy and job creation, climate impact and adaptation, and efforts to support and maintain the treasured landscapes of America in the emerging clean energy economy. Since it also controls (for the Secretary of the Interior) lease sales – with a large upcoming one in the Gulf it is a good site to check on periodically. Now to get back to what we’re going to do to get the oil/gas out if we are fortunate enough to get one of those leases. In really shallow water, or the bayous, you might launch your bit from a drilling barge, where the derrick can be assembled once the barge has been towed to the right place. Barges can be flooded to rest on the seabed in relatively shallow operations. However they are very susceptible to bad weather, and last April one had to be raised after being sunk during Hurricane Gustav. 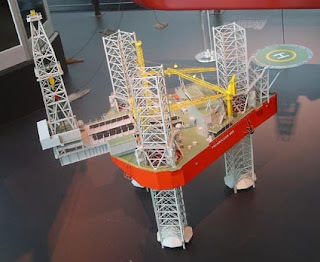 So, as one moves further offshore, then one might use a self-erecting tender from a barge, but would more likely move to something which could get the drilling floor stabilized and up above the waves. These are the jack-up rigs. Typically they have three legs, that are raised as the rig moves around. 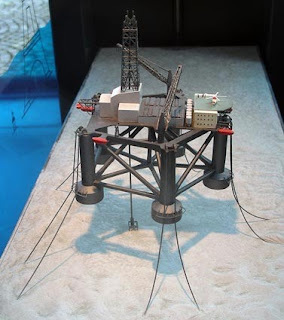 Then when it has reached the desired site, the legs are lowered to rest on the sea floor and the entire structure jacks itself up out of the sea, and, hopefully, above the waves. (You can get a paper model to cut out and assemble for this rig). There is also an animated video showing the installation of a rig at a site. They can do this to work in depths to around 500 ft. The discussion about damaged rigs gave links to the different rigs that have been damaged, and some of these have photos of the rigs in better days. As one goes out to deeper depths, then one will look for a more substantial vessel and so one comes to the Semi-submersible. These are built to either sail themselves, or to be towed out to the site, with the assembly floating, and then fluid is pumped into the bottom tanks to partially submerge the vessel and thus stabilize it. One can get some idea of the size of these from some of the photos shown where, (thanks to Ed Ames), wikipedia covers the subject. Since these are floating there has to be a way of holding them in place. 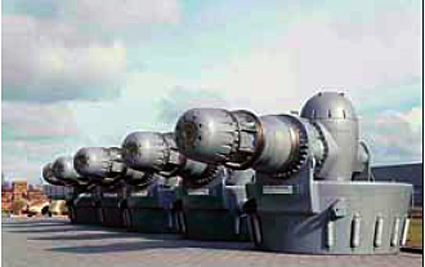 One way is to have them dynamically positioned, using thrusters to hold them in position, such as these. Note that it takes about 3 years to build such a unit. The alternative is to have the rig attached to anchors on the sea bed using cables, or tethers. (And for those interested in natural gas production, note that the same rigs are used for both). 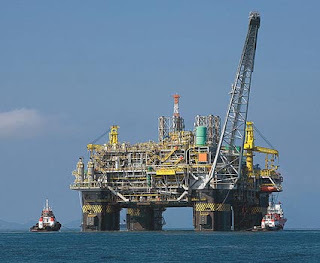 The connection between the well and the platform now becomes more flexible and special connecting pipes called risers are designed to reach from the blow-out preventer (BOP) at the top of the well, but on the seabed, and the platform. These must allow the rig to rise and fall with the tides and so models of behavior have to be written to design ways of allowing this. 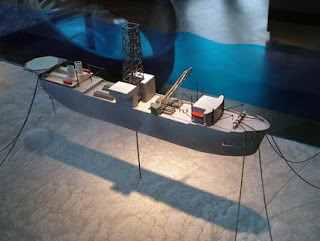 An alternative is to use a drillship to do the exploration. The drillship has the rig mounted in the middle of the ship, and can thus move around somewhat more easily than the others. It is generally held in position by dynamic positioning while drilling. (Video here). Once the field has been established, then a larger production platform can be brought out and placed where it can, using directional drilling, reach the best places to extract oil from the field. 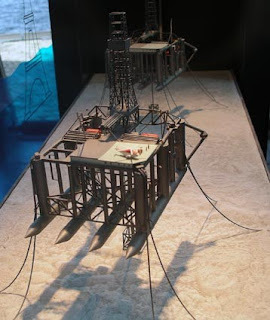 It is these large structures, such as that the Orlan platform from which Sakhalin Island oil finally began to flow recently, or the Thunder Horse, or Mars platforms. Although the former was due to produce by 2005, it was delayed by damage from Dennis and did not get up into major production until the end of last year, while the Mars platform was extensively damaged by Katrina. it is now back in production. "If a customer comes today with an order, he'll have to wait until 2009 for delivery," Choo said in an interview last week. "That's how busy we are. If he's willing to pay more, he can get a rig by 2008 from our American shipyard." By 2008 demand was such that prices had risen to half a billion dollars for a drill ship. As a result, drilling costs for some of the newest deepwater rigs in the Gulf of Mexico — the nation’s top source of domestic oil and natural gas supplies — have reached about $600,000 a day, compared with $150,000 a day in 2002. 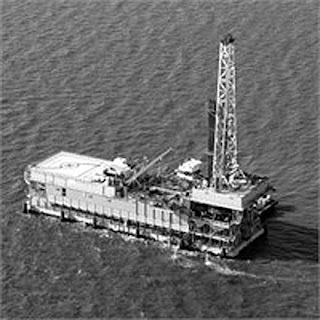 These record prices have spurred a new wave of drill-ship construction. This boom could lead to renewed offshore oil exploration that would eventually bring more supplies to the oil market, and push down prices. Already, 16 new drill-ships are scheduled to be delivered to oil companies this year — more than double the number delivered over the last six years combined. In fact, 75 ultra-deepwater rigs should be delivered from 2008 to 2011, according to ODS-Petrodata, a firm that tracks drilling rigs. The Chinese have also introduced a new design which is circular. The Sevan Driller is the world’s first of its kind, with the most advanced deep-water drilling capabilities that allow it to drill wells of up to almost 13,500 metres (40,000 feet) in water depths of up to nearly 4,200 metres (12,500 feet) and an internal storage capacity of up to 150,000 barrels of oil. The owner is Sevan Marine. The construction of this rig started at COSCO Nantong Shipyard in May 2007 and was relocated to COSCO’s Qidong Shipyard in April for derrick erection and final commissioning activities. The rig is due for delivery in the third quarter of this year and will be deployed by Petrobras in the Santos Basin, off the Brazilian coastline. As of last week it was on its way to Brazil (which takes about 75 – 80 days) where it will drill in the Campos Basin in just over a mile of water. Again this is a very, very brief and simplified look at some of the ways oil and gas can be produced from under the sea. It barely touches on some of the difficulties that are encountered, however. The sinking of the one barge shown at the top of the post could have been also repeated with pictures of other rigs in storms, and in battered condition. Nice Blog Thank you for Sharing information about such products. For Exploration Products like Wire Line Core Barrels visit Focus Mining . Nice Blog Thank you for Sharing information about Drill Rigs and their images. For Drill Rigs visit Focus Mining .